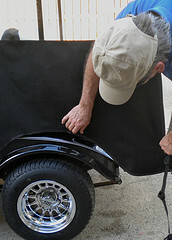 "Why are all the sides up on our new Sunbrella golf cart enclosure?" 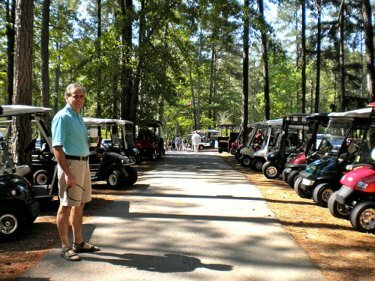 my wife asked on a cold 50 degree day as we skirted along the golf cart paths in Peachtree City. I couldn't say, "Because it's so warm out." 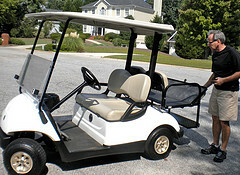 I had to tell her that the shiny new finish of our newly refurbished golf cart was more important to me than her comfort. 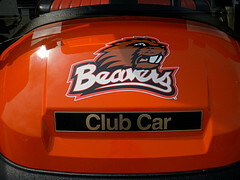 One of the things I like best about my newly refurbished Club Car golf cart is the new paint job - Black Crystal Pearl. 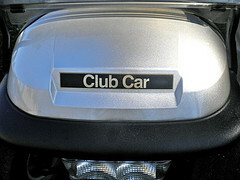 It has a great metallic glossy finish. Keeping it shiny and clean is actually fun and I love how it looks after I just wash it - which is quite frequent with all the yellow pollen in the air (breaking records with pollen counts of over 8,000). So it's not surprising that I noticed some small patches where the finish had dulled right where the sides of the golf cart enclosure had flapped against the golf cart body. If the weather has warmed up, don't be lazy and keep the sides down. 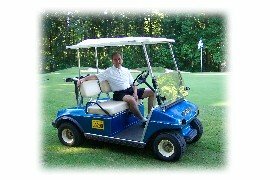 Roll them up, enjoy the spring and keep your golf cart finish shiny.